As you are by now likely well aware, we’ve been trying to figure out what the best monthly subscription service is for men. (If you’re not yet up to date, definitely check all those posts out before this one!) Specifically, there has been something of a duel between the two most similar services, SprezzaBox, and Gentleman’s Box. This month, SprezzaBox pulled off an absolutely incredible box, so all eyes are on Gentleman’s Box to see how they do this month as well. As is usually the case for Gentleman’s Box, there is a theme of the month. This time, it is horror and the movie IT. Which, to be quite frank, I am not such a fan of. I understand that it is October, and that Halloween is right around the corner, but this is a Gentleman’s Box, not a pop-culture box. Opening this up and seeing fake blood stains on the usually clean, white paper is just a little off-putting and out of place in a box like this. I know they were trying to be cute, and I understand where they were coming from on this, but I just think they missed the mark. Keep It Simple Socks Black and Grey Bowtie Socks — $12: Cute socks. Personally, I would like them more without the bowties, but, as I have said before, these boxes are great for stepping a bit outside of your comfort zone. Will I actually wear these socks? Guess we shall see! They feel nice and solid regardless. Lord Of Ties Black and Gray Check Tie — $30: Not a $30 tie. It’s 100% and it feels super stiff. The $15 cotton ties from The Tie Bar feel infinitely better. Plus, this one is 2.50”, even skinnier than the usual 2.75” included in these box. I have long wanted 3” ties, but it seems like we are moving in the wrong direction. As far as versatility goes, this happens to hit all the marks. Great with any grey or black outfits/suits. DIBI Black and White Shoelaces — $10: $10 for shoelaces? Okayyy. They seem pretty cool, honestly, and the metal tip is definitely different. I am not sure how good these will look with black dress shoes, or if I will ever wear them, but they seem solid if you’re more into swapping out your shoelaces than I am. DIBI Suspenders — $60: Clearly, this is where the big money is in this box, and why there is one less item than usual. But suspenders are a bit of a risky move. Most people don’t wear them very often (despite the little article in the Gentleman’s Post trying to encourage otherwise), and I can tell you personally that as cool as these might be, these are going to sit in their box in a drawer somewhere until the next time I wear a tuxedo — which is not very often at all. But hey, like I said above, I guess this is a good thing to have somewhere in my closet and is only the sort of thing I would because of a box service like this. Balloon: Really? Look, if this was an additional item to the usual five, as a throwaway gag for the month of October and the movie IT, fine. It’s funny, and I would like it. But there were only four items in this month’s box, so this essentially functions as the fifth. I don’t like the horror theme in the first place, and this now is not helping. And, from the company’s perspective, how sure are they that every guy is going to get this? I showed it to my wife and she could not understand why they would put a balloon in the box. She said it seemed unprofessional. I don’t want to rag on this too much more, other than to say I just don’t think it was very thought through. 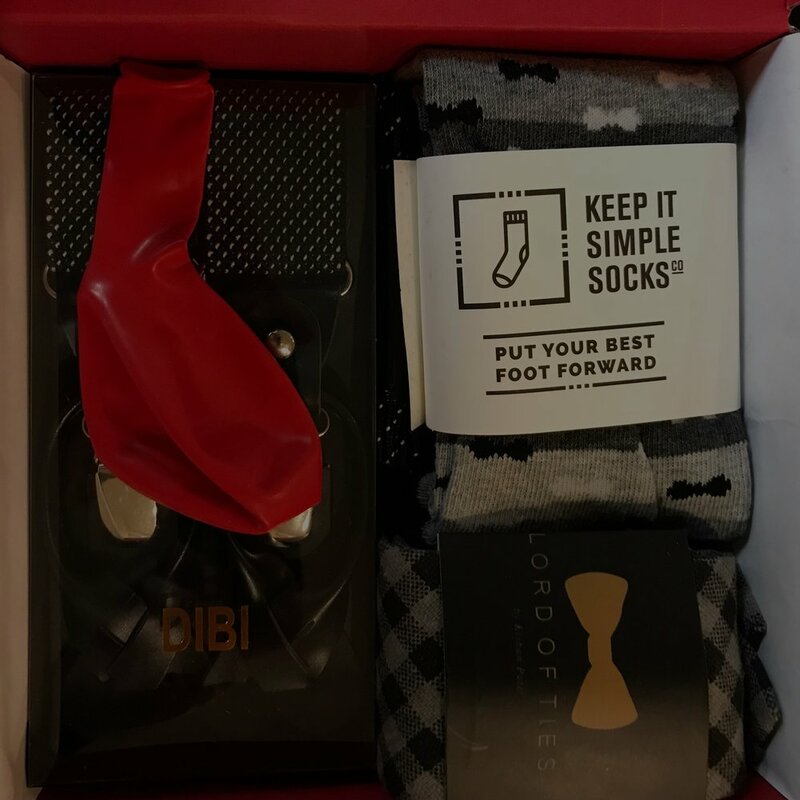 I have to say, this was my least favorite box so far from Gentleman’s Box — and it comes right after my most favorite box from SprezzaBox. This Gentleman’s Box had a mediocre theme, one less item than usual, and one or two items that many people won’t actually use. For all my past reservations about box services like this, it is this month’s box from Gentleman’s Box that really bears them out. Look, past boxes have been better, and future boxes are always a new opportunity. But as it stands right now, the $3 more a month that SprezzaBox costs seems to allow them to do a whole lot more, a whole lot better, and I think I prefer their taste overall as well. SprezzaBox is thus not only a better value than Gentleman’s Box in my opinion, but it’s actually a solid value, period.